What’s a mother to do? This summer an ultra trendy, augmented reality game called Pokémon Go launched and took the world by storm. 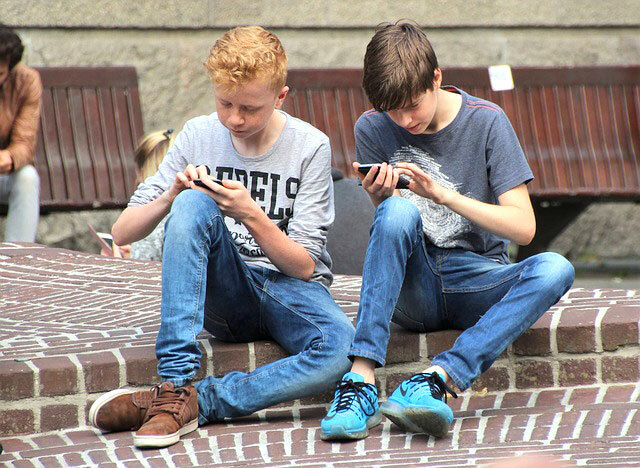 If you live in a city, you invariably saw children and young adults walking around with eyes glued to their smartphones seemingly oblivious to the real world. My two little guys wanted to see what all the fuss was about and quite frankly, so did I.
What’s a mother to do? I tell you: suit up. So after making sure that I used a new gmail account to register for the game, I downloaded it from iTunes. I picked my avatar, a very cool chick with purple hair and purple clothing, and created my user name: MamanOurson (Mama Bear in French). Backpack? Check. Tennis shoes? Check. I was locked and loaded and it was on. Pokémon Go launched early July in the United States and met with spectacular results. The game had more than 50 million downloads in the first three weeks, which is more than Facebook and Instagram had during the first six months of this year. Now, here we are, two months later and the Pokémon Go frenzy has tapered off a bit. People are still playing, but we are seeing less of the mobs and hearing less of the horror stories (robberies, accidents, stabbings and more) that the first two months induced. Niantic and Nintendo (Pokémon Go creators) are launching in India and a few other countries very soon, so I am relatively certain that we will be hearing more stories, good and bad. Whatever your starting point, an evaluation of the game is in order. And I wanted the opportunity to tell you some good things about Pokémon Go. “What good things?” you say. I know, I know, there are lots of disadvantages, but after having played the game all summer in my utmost dignified eSafety consultant capacity and reaching a ridiculously high level as a Pokémon trainer, I thought I would provide you with my overview of Pokémon Go. You can reduce the risks and increase the benefits of playing Pokémon Go by being alert, reading up on the game, talking with other parents and not taking it for granted that your child can play alone. Certainly two months in, a lot of the kinks have been ironed out, but you still need to be vigilant. Protect your data and privacy by keeping the game updated and remembering that the game does allow for the geo-localization of your child — so play prudently and with your child. Make it a family ritual, like movie night. The game can bring you and your family together for walks or hikes. Play with your children, ask them questions about the game, the trend, what’s happening in the press. As with any new game, new piece of technology or new online trend, use it as an opportunity to connect with your children. Pokémon Go, like the Internet, is not evil, although there are people, online and off, that can spoil the fun for all. It is certainly true that bad things can happen while playing Pokémon Go, just like being online, but you can minimize those risks by engaging in certain safety measures. And one safety measure is to equate Pokémon hunting to the American tradition of trick or treating for Halloween: you wouldn’t send your child off to unknown neighborhoods day or night without some sort of surveillance, so why do so just because it’s a game? Augmented reality is really cool. You get to see the little monster characters in the real world and it’s just a teaser of what’s to come. Augmented reality and virtual reality have made huge strides and it’s only a matter of time before we all have headsets and get connected. Don’t believe me? Virtual reality is what airlines use to train pilots in simulations and augmented reality has demonstrated beneficial uses in education. (Check out Microsoft’s augmented reality headset called the HoloLens, which is at the cutting-edge of education and technology). You will get exercise. Getting outside has benefits on mental health and physical health. Full disclosure: I have caught many a Pokémon from the comfort of my sofa (hey, it was research), but the game does become more interesting when you are walking around, catching the sights and chatting with your children. (The phone can buzz to let you know if there is a Pokémon nearby so it is not necessary to gaze at the screen in rapture while crossing busy intersections.) More disclosure: I lost absolutely no weight in my quest to capture Pokémon, although I feel lighter and surely that must count. Educational sight-seeing is right at your fingertips. Every Pokéstop has a little box on the top with the name of the stop. For the uninitiated, a Pokéstop is like an online service station where you can fill up with goodies for hunting. Pokéstops are usually public places, parks, monuments, churches and an occasional police station. If you click on the name, you will get more description of the location. Niantic missed an incredible opportunity to really provide educational fodder to the game, but I bet later releases will do so. In the meanwhile, you can map out your hunting grounds and Google the Pokéstops so that you can amaze your children with your astounding grasp of history and geography. It’s the future. This trendy little game has captured the imagination of millions and while the trend may be fading, there will obviously be more games to come, more technological advances to come. Get a glimpse of the future even if you only play for a week. You’ll be able to tell your grandkids, “I remember back when augmented reality was just a pocket monster and today we are ___” (insert your own futuristic fantasy because mine only involve Star Trek). My overall recommendation is for parents to play the game WITH young children, and to communicate regularly with older children about ways of staying safe. Pokémon Go is fun and immersive and this trendy game provides parents with the perfect opportunity to engage with their children around technology and to point out safety tips as they do so. Take advantage of the opportunity. Now get out there and go catch some Pokémon. And with any luck, maybe we’ll end up battling it out at a Pokémon Gym. Loser buys the Chardonnay! Get the "Parent's Guide to Pokémon Go" on Amazon! Elizabeth spent her summer playing Pokémon Go, researching the good and the bad and writing it all up in The Parent’s Guide to Pokémon Go: 50 Lessons Learned After 50 Days of Game Play. The ebook is available in English and in French on Amazon. If you have other questions or concerns about technology, social media, Internet and our children, please join her Facebook group, The Digital Parenting Community, where you will be supported and cheered on as you parent in the digital age. Elizabeth Milovidov is a California transplant who has lived, learned and loved in France since 1995. She came to Paris, dreamy-eyed and searching for 'la grande amour.' And she found it -- although not with a Frenchman named Pierre, as expected, but with a 6'8" Russian named Sergei. Go figure. On the professional side, Elizabeth is a lawyer, law professor and eSafety consultant who regularly speaks on Internet safety issues, blogs for the Family Online Safety Institute and coaches parents on best practices in the digital age. She is a part-time eSafety consultant at European Schoolnet, an independent expert on children’s rights and Internet for the Council of Europe and a full-time mom to two tech savvy little boys. She is also an advisor on the European Commission Joint Research Centre project “Young Children (0-8) and digital technology.” For free tips and resources, you can visit her website www.digitalparentingcoach.com.